Here's a post with no special story to go along with it. I just thought you might like to have these obscure discs. They come from the cleaning woman stash that I've mentioned in several other posts. I picked up a lot of interesting sides in that haul, and these probably won't be the last of them to appear here. 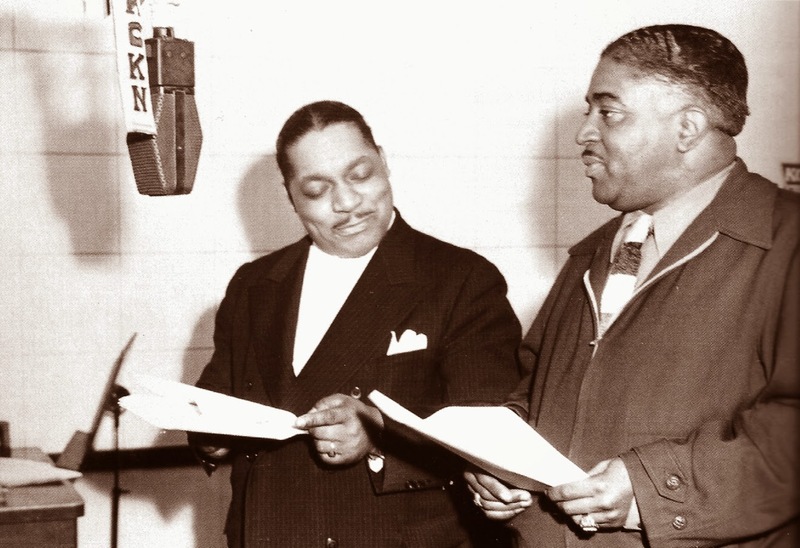 These two gents, along with Albert Ammons, were the pianists most associated with that two-fisted piano romp on the American song form known as boogie woogie. 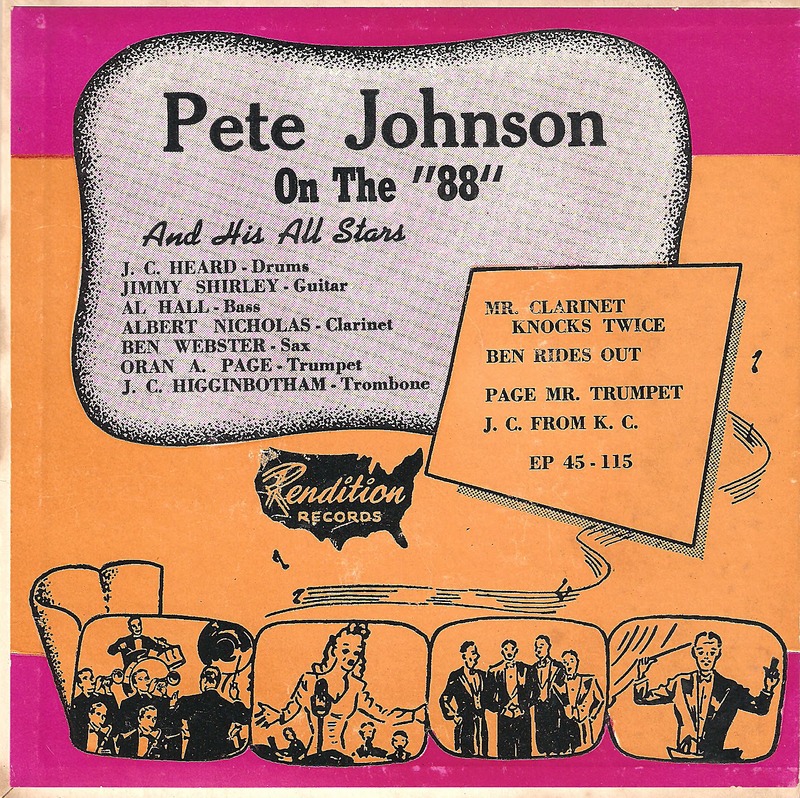 Pete Johnson is most often thought of as a product of the Kansas City jazz era, and so he was, but he also made a name for himself by beating it out in tandem with Ammons or Lewis (and sometimes both). Meade Lux Lewis may have been the first to record in the boogie style, waxing his "Honky Tonk Train Blues" way back in 1929 (he recreates it here, too). the studios of KCKN in Kansas City in the '40s. 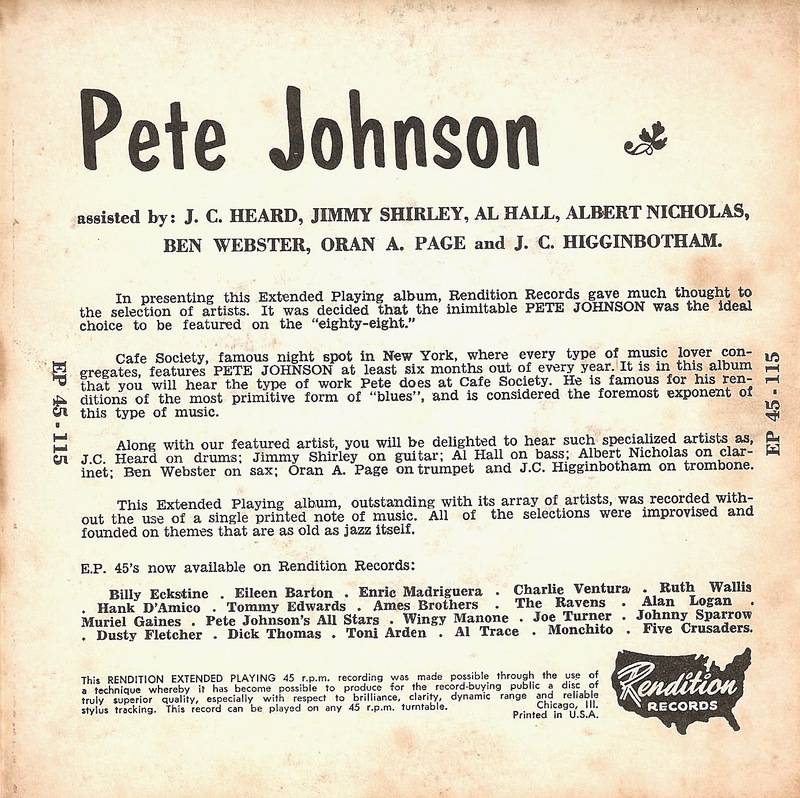 These Pete Johnson tunes were originally recorded for National and then were reissued on this little EP for Rendition. In the '50s they came out again on Savoy and are probably available on a number of contemporary CDs, but I couldn't resist posting them anyway. The presence of Ben Webster on one cut and Lips Page on two is an added treat. 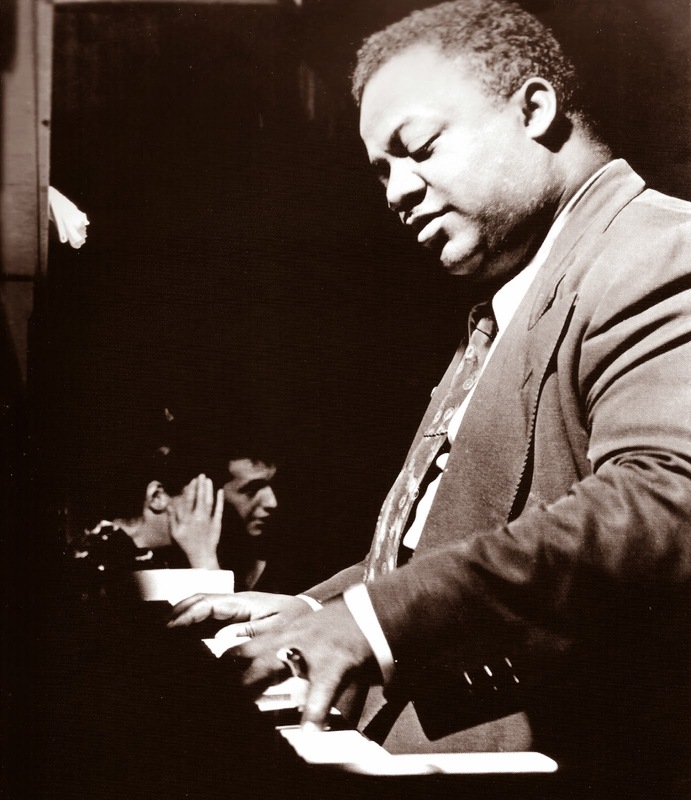 Including the New Orleans sound of Albert Nicholas makes for a rare pairing, and Higgy literally wails on his number. 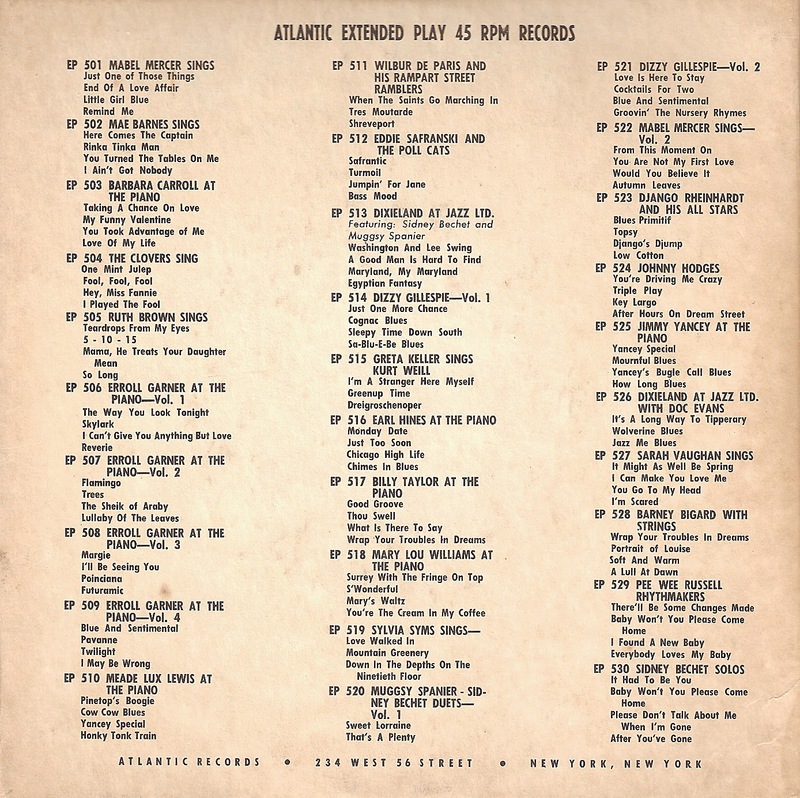 Lewis's four tunes for Atlantic, done in 1951, are exactly what you'd expect – bumpda-bumpda in the bass and a fistful of eighth notes in the right hand. To my ear, there's more than a little hint of rock 'n' roll here. He pays tribute to three of the greats – Pinetop Smith, Cow Cow Davenport and Jimmy Yancey – and then fetes himself with his own composition. He's subtly accompanied by a bassist and drummer who, to this date, remain anonymous. So here's a half-hour of good blues for when you're in a toe-tapping mood. The Lewis disc looks pristine but was plagued with surface noise. Much of it has been removed, but some still remains so be forewarned. The Johnson tunes are all sonically clean. As always, these files were created right from the vinyl originals. Beat me, daddy, eight to the bar! 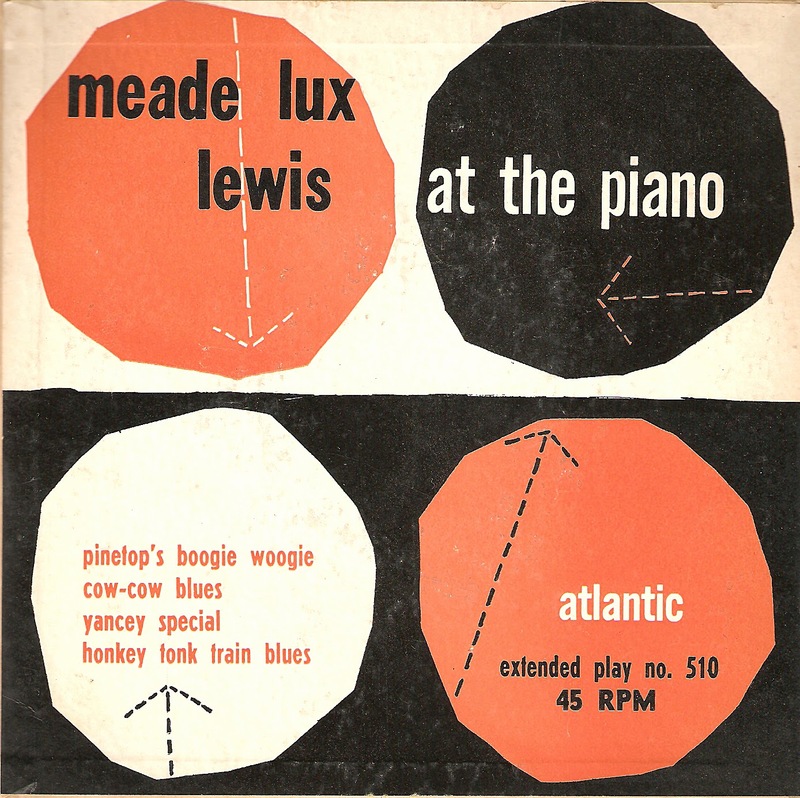 Meade Lux Lewis, p; unk. b, d.
J.C. Higginbotham, tbn; Jimmy Shirley, g; Al Hall, b; J.C. Heard, d.